Building on the First Edition, our new K-5 Language Arts curriculum is a comprehensive, standards-based core literacy program that engages teachers and students through compelling, real world content and builds equitable and inclusive learning opportunities for all students. Our curriculum has consistently received high reviews from independent and state and local education departments, including EdReports.org, EQuIP, New York State, New York City, Connecticut and Washington. In partnership with Open Up Resources, we proudly offer professional development, print materials, and other essential services. What makes our ELA curriculum different? It’s written by teachers for teachers. Former and current teachers in public schools across the country joined together in this work. It's not the product of a for-profit publishing company. It’s a comprehensive full year. Our curriculum is written on the daily lesson level and provides a full school year of instruction, assessment, and differentiated supports to address all of the Language Arts standards. It’s free and available online. Our curriculum is an open educational resource that can be accessed by any educator in the country. It challenges and engages all students. We included supports for students not meeting grade-level standards, extensions for students ready for more challenge, and built in supports for English language learners. How is our curriculum structured? Each module in grades K-2 is comprised of two one-hour blocks of content-based literacy (Module Lessons and K-2 Labs) and a third hour of structured phonics (K-2 Reading Foundations Skills Block). Together, these three hours of curriculum teach and formally assess all strands of the Language Arts standards for each grade level. The K-2 Skills Block uses a structured phonics approach, grounded in the Phase Theory of Dr. Linnea Ehri, which describes behaviors related to the types of letter-sound connections students are able to make as they learn to read and write. Each module in grades 3-5 is comprised of two one-hour blocks of content-based literacy instruction (Module Lessons and the Additional Language and Literacy Block). Together, these two hours of curriculum teach and formally assess all strands of the Language Arts standards for each grade level. 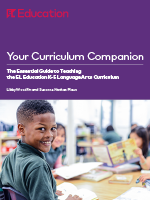 Our "must-have" companion guide to the EL Education curriculum. This essential guide is one part roadmap to the curriculum, one part orientation to its instructional practices, and one part coach—to answer your questions, relieve your stress, and put you and your students on the road to success.